Today I hold in my hands something very special to Chiropractic’s history! …not to mention, very fragile. My latest Chiro-pick happens to be an original, glass “spinograph” plate from 1920. There are many things that make this early X-ray very cool. 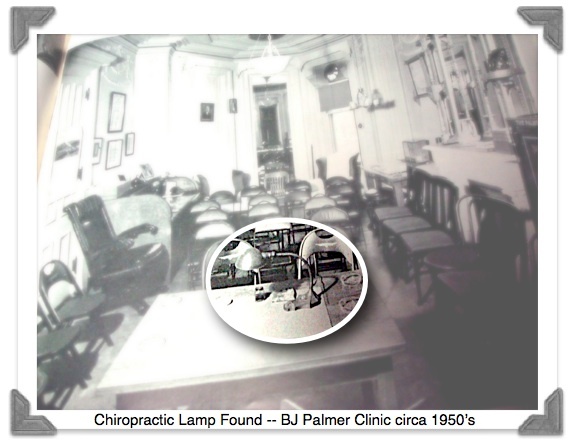 For one thing, it came inside an envelope that stated “Palmer School of Chiropractic 1920” — meaning that this image was made only ten years after PSC introduced X-rays to Chiropractic! The Instructor’s name on the spinograph is E.A. 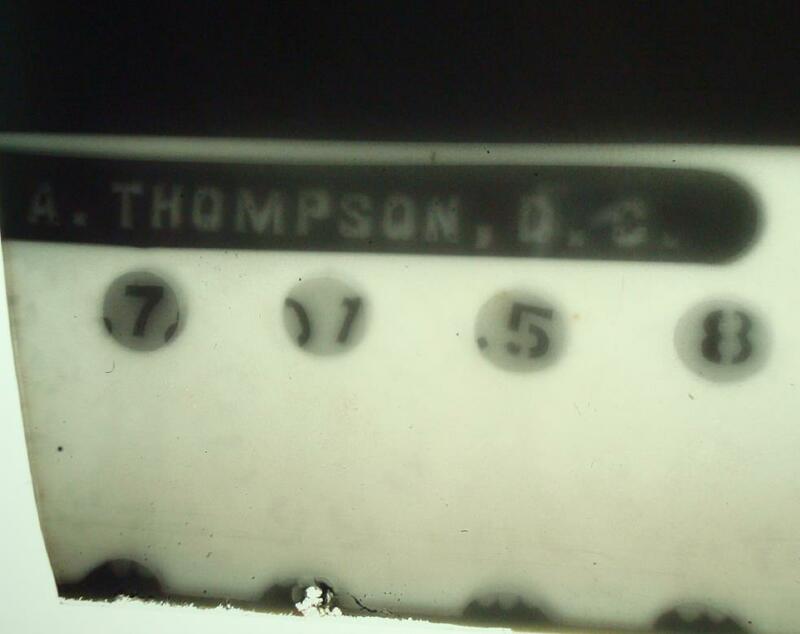 Thompson — the same Thompson who wrote Green Book vol 10, CHIROPRACTIC SPINOLOGY. I am sure thousands of these spinograph plates were made; however, I am also sure there are not many of these that have survived. From an antique collecting perspective, glass, like paper, needs to be handled and stored with care, otherwise it will be destroyed and discarded. I think it is a miracle this glass plate survived. And we are very fortunate that its paper envelope and spinograph reading survived these years so we can view how the first spinographs appeared. The glass plate is not very transparent. The x-ray image cannot be viewed by holding it to the light of a window or overhead light. I laid the plate on an artist’s light box where the image could be viewed. I imagine the viewing boxes at Palmer were even brighter than mine for best viewing results. The front side of the plate was smooth and shiny and could be wiped with a liquid glass cleaner. However, the back side held the image in a thin lithograph that could easily be scraped off. Naturally, I am not attempting to clean up this side for fear of rubbing off the image. 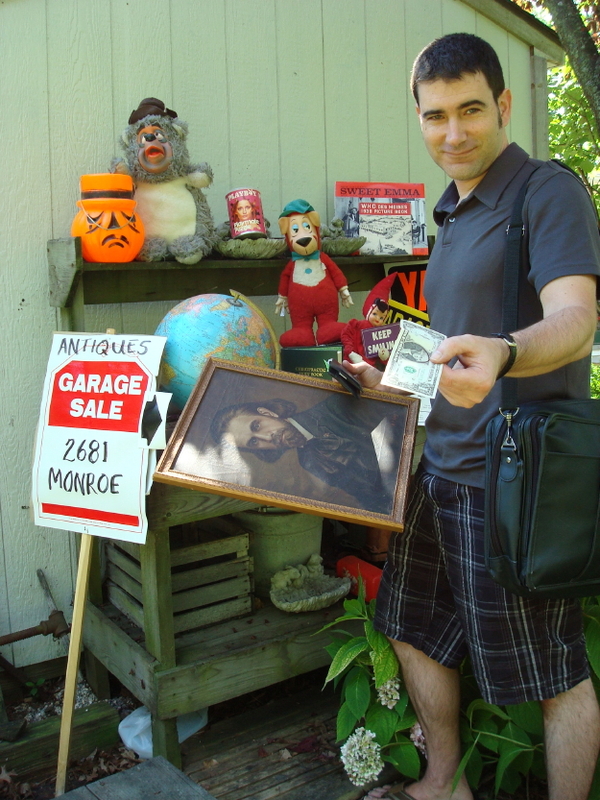 A chiropractic relic such as this becomes one of the most prized items in my collection. Spinographs were some of the first tools used by the pioneers of chiropractic. These plates provided the first physical proof of the existence of vertebral subluxations. Remember, in the early days the medical community insisted vertebral subluxations were impossible without a fracture or dislocation. The spinograph could now establish chiropractic as a science opposed to the mere the “quack theory” or “art” it was designated by the medical establishment. Chiropractors could now view subluxations and have the information needed as to what to do and where and how to work to restore health. Science proves. Spinography. Leave it to BJ to coin his own word instead of using the medical one that was readily available. But that was how BJ rolled. Essentially, the term “spinography” was BJ’s way of adding particular emphasis and attention to x-rays of the spine and positioning chiropractors as the expert. And while the term is all but common these days, it did evolve to encompass the system of x-ray measurements for vertebral alignment. Even back in the day, BJ’s spinal x-ray nomenclature caught flack from the health care community at large. A medical text sarcastically criticized that spinography might be confused for “x-raying after the patient has eaten spinach.” Nevertheless, BJ’s word did make its way into many dictionaries, including medical ones. Interestingly, when BJ introduced spinography to the Palmer School of Chiropractic in 1910, he encountered a very strong and unexpected pushback. 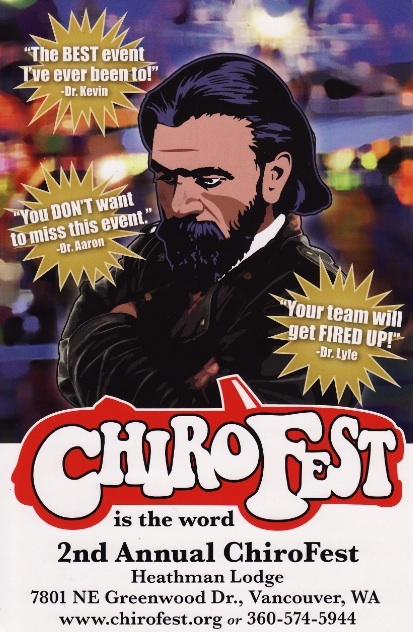 Many faculty, students, and alumni thought it a useless addition to the science of chiropractic. They all had well-developed palpation skills and their patients were seeing great results. Chiropractic did not need x-ray in 1895 — why now in 1910? It took the farsightedness and forward-thinking minds of the time to bring x-ray into common practice, no matter the profession. Palmer certainly was one who fit such a category. 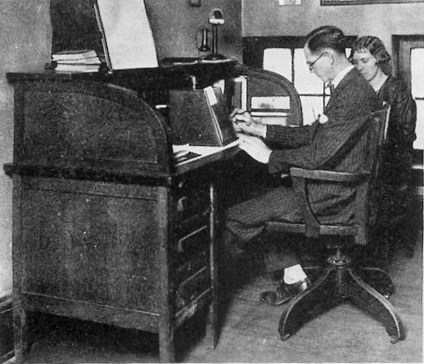 By the late 1920’s and early 30’s x-ray instruction was a standard part of the chiropractic curriculum in all the schools. 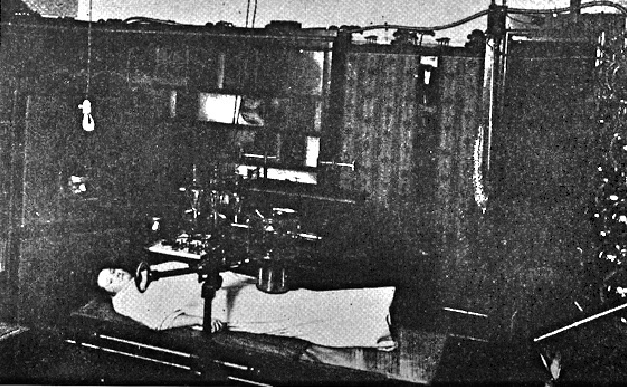 In the beginning, x-ray equipment was rather clunky — not to mention frightening for the patient as they held themselves motionless for minutes as strange sounds emanated from the mammoth apparatus. 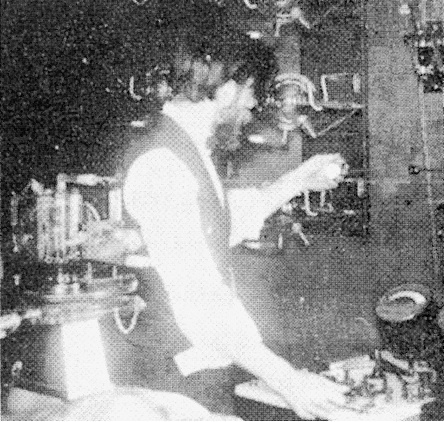 Operators had to know spark gap settings, work with electrical dangers, and be prepared to change tubes on a moment’s notice. The actual radiographic picture [like the Picker’s find] was produced on glass plate, and as one might expect, the image obtained was far from the clarity we see today, not to mention relatively heavy and fragile. And while it was bound to happen anyway, the transition from glass plate to celluloid film took place, in part, because of World War I —due to the difficulty in obtaining glass from the preferred manufacturer in Belgium. 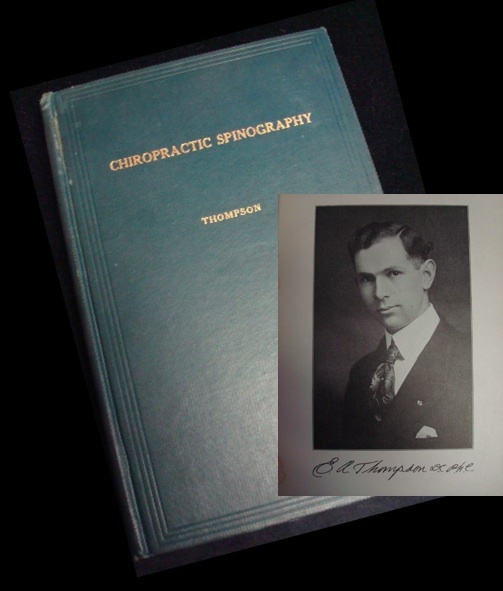 Dr. Ernest A. Thompson was the head of the Palmer School of Chiropractic Spinography Department from 1914 to 1925 and was the author of the first book on chiropractic use of x-ray — a Green Book appropriately titled Chiropractic Spinography. 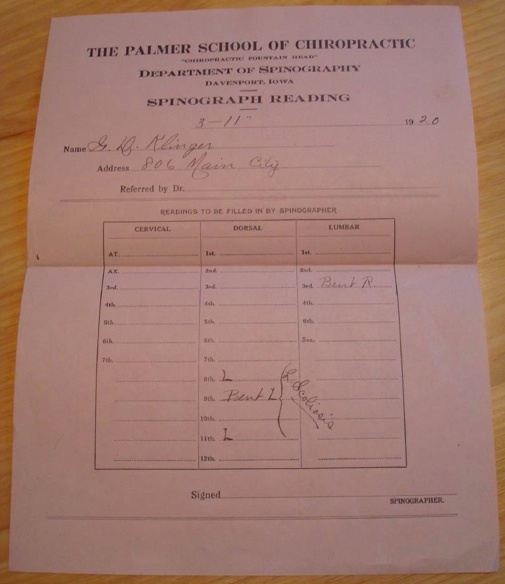 As a service to the profession, the Palmer School of Chiropractic ran a Spinograph Reading Service under Dr. Thompson’s direction. I’d like to acknowledge the work of Robin Canterbury, DC, DACBR which appears in the book Chiropractic: An Illustrated History as a chapter on the history of x-ray in our profession. 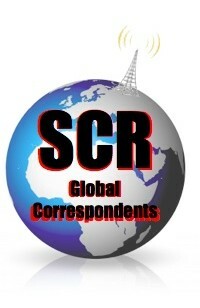 Much the information that was used to write my DC Angle came from this source. 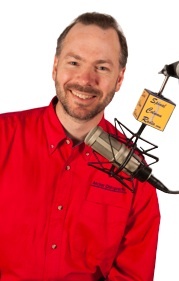 Dr. Thomas Lamar loves chiropracTIC and is fascinated with its history. 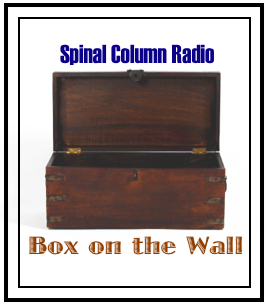 As the host of SpinalColumnRadio.com he often finds himself behind the mic, turning back the pages of yesteryear, chronicling the amazing tales of our profession. 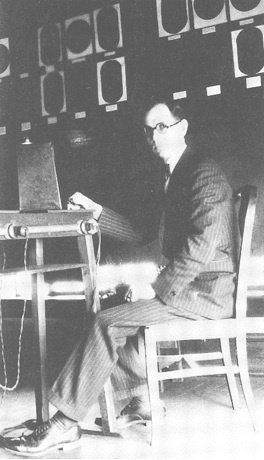 Listen to his report on the Picker’s Spinograph find on episode 133. 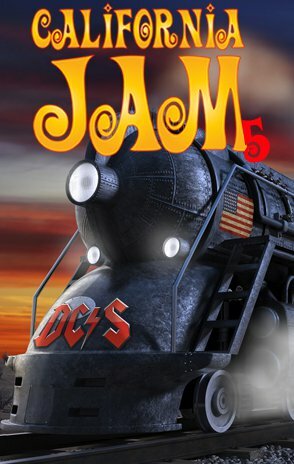 Lamar podcasts, with the assistance of his audio-engineer son, Logan, from his home studio in Kingston, WA. He also practices in the same town with an emphasis on family wellness. 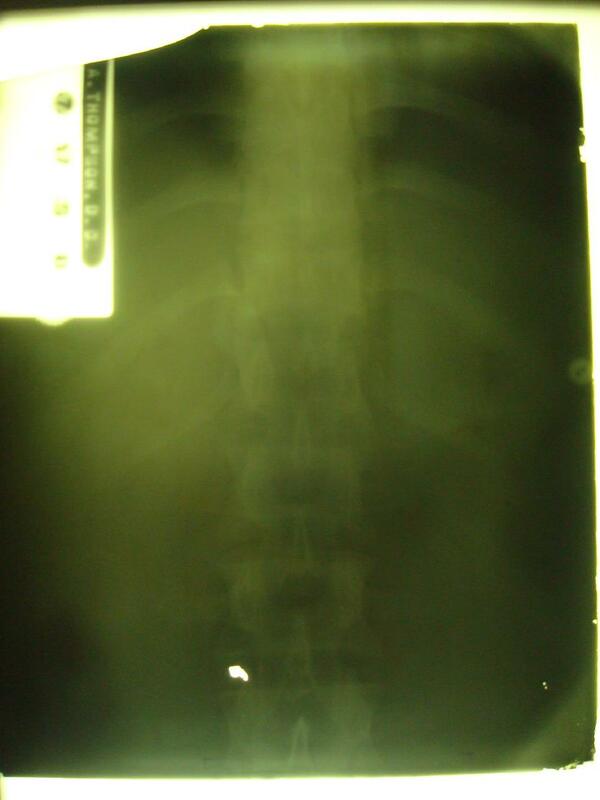 Wow, I was surprised when Todd sent me the photo of the glass plate x-ray. 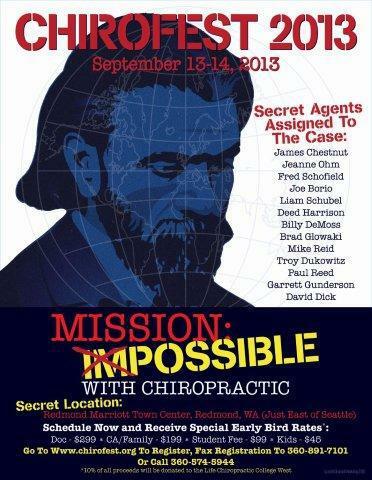 It is really cool to see this long-lost piece of Chiropractic history that you only read about in the Green Books. What even made it better was it had Dr. Thompson’s name on it. I am impressed! What a great find. These original spinographs are very rare indeed. 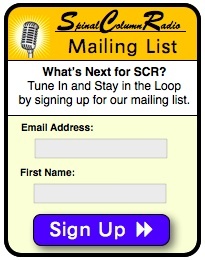 I have not seen any of these ever! Even at Palmer. Love it and thanks for posting. 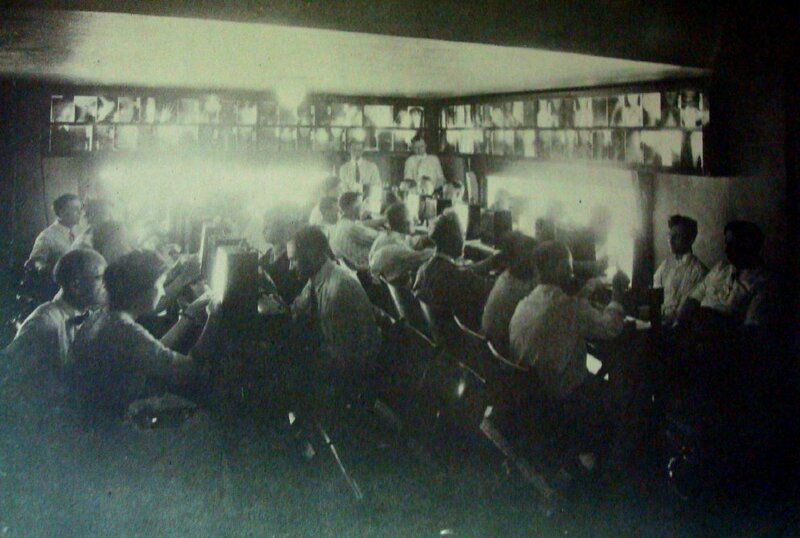 I really Love the photo with all the spinograghs (films) in view boxes and all the students examining them. Chiropractic has a science all its own, and one part of that is our interpretation of spinal x-ray films. Chiropractors need to have an understanding that the way we view films can be completely different from the way medics view film. We must never forget the spinal x-ray is a moment of spinal stillness caught on film. We must remember that the spine is rarely still in real life and to view it as a dynamic flowing column that is protecting the spinal cord while providing structural integrity and support of the human frame. Many times we get caught up in looking for pathology when our time would be better spent looking for subtle clues to help us deliver the best adjustment possible. The picture is really great and makes me proud of my heritage as a chiropractor. You can feel the passion these students have for the science of chiropractic. It would be great to be able to take part in the fantastic discussions they must have had that day. Thanks Todd for giving us a piece of our past that helps us be proud of who we are and where we have come from.